Aerogel is traditionally made of synthetic materials and is similar to glass, but has gas or air in its pores – only a few nanometers wide – instead of liquid. Aerogel boasts a low thermal conductivity – low density, too – which is why NASA uses the material to cool rocket fuel. Additional applications include bio-scaffolds, energy storage devices, sensors, cold-weather apparel and shoe inserts. Recently, bio-aerogels have been developed out of bacteria cellulose, pectin and watermelon – all using an inefficient, bottom-up approach. The consumption of both energy and time is significant in these bottom-up approaches, which prevents large-scale production. Scientists in the University of Maryland (UMD) Department of Materials Science and Engineering (MSE), led by MSE Professor Liangbing Hu, took the opposite approach – they went ‘top-down’ to create an anisotropic – having a physical property that has a different value when measured in various directions – aerogel made entirely out of natural wood – balsa, in this case. Balsa – which has low density, high porosity and thin cell walls – makes it the lightest wood on Earth. 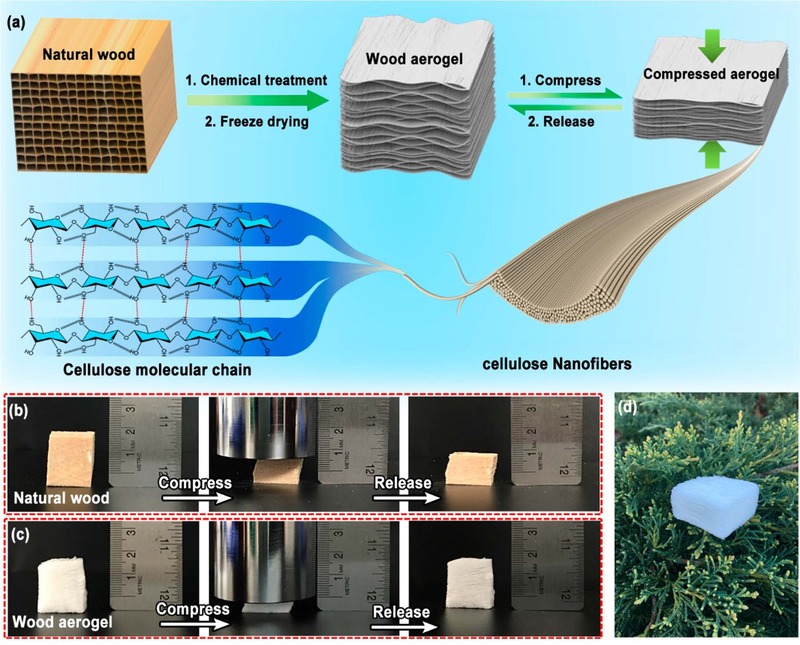 After a block of Balsa wood is immersed in a mixed chemical solution, “the lignin and hemicellulose of the natural wood are removed, while the alignment of cellulose nanofibers is preserved, leading to a layered structure of the wood aerogel,” Hu’s research team stated in their paper. The result, in essence, is a wood sponge, which is lightweight, highly compressible and anti-fatigue. Moreover, wood aerogel is eco-friendly, easily and cheaply produced, scalable and effective, offering a range of applications, such as thermal insulation, acoustic insulation, pollution adsorption, sensory equipment, energy storage devices and electronics. Jianwei Song, Chaoji Chen, Zhi Yang, Yudi Kuang, Tian Li, Yiju Li, Hao Huang, Iain Kierzewski, Boyang Liu, Shuaiming He, Tingting Gao, Sevket U. Yuruker, Amy Gong, Bao Yang and Liangbing Hu. “Highly Compressible, Anisotropic Aerogel with Aligned Cellulose Nanofibers.” ACS Nano, 2018, 12 (1), pp 140-147. DOI: 10.1021/acsnano.7b04246.